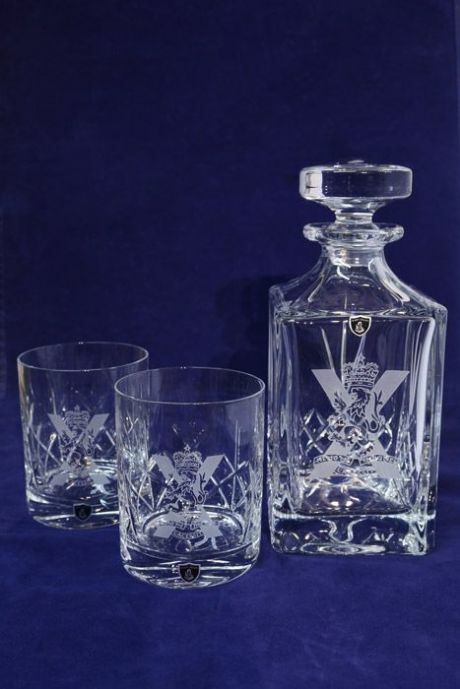 Scottish Regiment crystal cut decanter and two whisky glass set, in a silk lined presentation box. SCOTS, Royal Scots, The Black Watch, KOSB, Argyll's, Highlanders, Gordon Highlanders, Scots Guards available. This wonderful full sized crystal cut (75cl) decanter set comprising of decanter and two 10oz cut panel whisky glasses, each item having an engraved regimental cap badge. This set is also available with either 4 or 6 glasses and the option to add a presentation wooden tray. Currently available for most Scottish regiments plus several UK regiments as well as a Royal Navy & Royal Air Force options. Please contact us to discuss further options or to get a specific regiment or cap badge set up. Please contact us to discuss any queries you may have with regards delivery.